Before the twentieth century, science, art history, and painting restoration were fields that had little to do with each other, but beginning in the 1930s technological advances led to the scientific examination of paintings, enabling a collaborative approach to research. This model continues to provide the most valuable insights into a painting’s history, condition, and the creative process by which it was made, information that is crucial to conservators in deciding on a course of treatment. An overview of painting examination tools will be presented, with brief discussions of UV light and microscope examination, imaging techniques such as X-radiography and infrared reflectography, and several forms of instrumental analysis used to characterize painting materials. A number of case studies will illustrate how these tools of science enable a better understanding of paintings and how it can influence their conservation treatment. 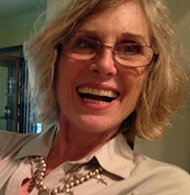 CAROL CHRISTENSEN received a MS in painting conservation from a collaborative graduate program at the Winterthur Museum and the University of Delaware. She received a BA in art history at Skidmore College. In 1983 as a Fulbright scholar she studied German restoration techniques at the Gemäldegalerie, Berlin. She is a Professional Associate of the American Institute of Conservation, where she previously served as the project chair for the painting specialty group catalogs and is a past editor of the AIC Newsletter. She has published on the materials and technique of a wide range of Old Master painters, including Raphael, Frans Hals, Van Dyck, Gainsborough and lesser known Early Netherlandish and Sienese Renaissance artists. She has a special interest in the works of Paul Gauguin, whose technique she has discussed in several past and forthcoming articles. Since 1981 she has worked at the National Gallery of Art, Washington, where she is Senior Painting Conservator, and she also runs a private painting conservation studio in Alexandria. President Larry Millstein called the 2338th meeting of the Society to order on November 7, 2014 at 8:10 pm. He announced the order of business, welcomed new members, and announced the death of Joe Coates, a past president of the Society. The previous meeting's minutes were read and approved. The President then presented a summary of the 13th meeting of the Society on October 21, 1871. He then introduced the speaker for the evening, Carol Christensen, Senior Painting Conservator at the National Gallery of Art. Her lecture was entitled "Revealing Art: Science in the Technical Examination of Paintings." Ms. Christensen introduced her topic by noting that for painting conservation, knowledge of chemistry is as important as artistic skill. Scientific studies of material properties and the effects of humidity, vibration, and temperature are important for conservation and inform the treatment decisions of conservators. 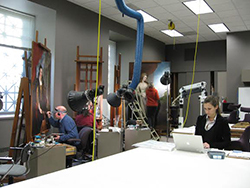 Since the 1930's, conservation protocols have been developed by collaborative research between conservators, art historians, and scientists. There are three basic analysis types in use: first, spectroscopy, such as X-ray radiography, infrared, ultraviolet, XRF, and FTIR; second, optical or electron microscopy; and third, chromatography. UV examination has been in use since the 1920's. It can reveal uneven cleaning, varnish treatment, repairs, and retouches. IR reflectography, can show unseen underlayers and sketches since many paint films are transparent in the near IR. Modern digital systems are used to collect and assemble images rapidly, and semiconductor sensors have improved penetration, resolution, and spectral range of the technique. As an example, IR imaging of "Portrait of a Man" by Frans Hals, circa 1650, revealed a hat on the subject's head that had been painted over. Radiography can also be used. For instance, paint containing lead shows up as bright areas in an Xray-radiograph. Another technique is neutron activation autoradiography. Conservators can also analyze the wood used in paintings, using tree ring analysis, which assists in dating the painting. Optical microscopy is another technique that is used to assess condition, study the artist's technique, and differentiate original work from later repainting. All these techniques enable a conservator to follow the artist's creative process and to make conservation decisions about what to restore. Pigments can also be sampled and analyzed. These techniques can detect forgeries which use pigments unavailable at the purported date of the painting. More recent pigment analysis uses non-invasive methods such as XRF. As an example, Ms. Christensen showed a Van Gogh, "Undergrowth with Two Figures." All the flowers appear white, but Van Gogh had described the painting as having pink and white flowers. Analysis revealed which flowers had used the once-pink pigment, now faded to white. Ms. Christensen also said that compounds in painting can be analyzed by techniques such as gas chromatography, mass spectrometry, FTIR, and Raman spectroscopy. Ms. Christensen then presented two case studies. The first was "Portrait of a Man" by Hals which had originally included a hat, subsequently painted over. Conservators had to make decisions about restoring the painting to its original state. Historical research suggested that the hat was considered to be in a "roguish style," and that the sitter or a later owner may have regretted this sartorial choice and had it painted over years after it had left Hals' studio. The second case study was "Brittany Landscape" by Gauguin, dated to the late winter of 1888 when he was moving away from an impressionistic style. Conservators wondered why the composition of this painting featured inconsistent elements. In fact, the painting has three compositions, painted on each other. X-ray radiographs showed an underlying composition with large buildings, barns, a church steeple, and maybe a house. Hyperspectral infrared imaging showed another composition with a mill complex. Paint cross-sections with no demarcations between the layers show that Gauguin was not painting over an old painting, and all the compositions were probably painted within two to four days. Some final compositional devices are still puzzling. Gauguin did not block out the older compositions when painting over them, focusing only on the new. But, according to Ms. Christensen, he may have, pre-consciously, echoed certain features as strangely-shaped hills and reflections on the water, even though they were incommensurate with his painting of the sky. Here, analysis tools revealed the creative process of the artist. Ms. Christensen closed her lecture by reiterating that, as these examples demonstrate, art conservation is a close collaboration between the conservator, scientist, and art historian. After the question and answer period, President Millstein thanked the speaker and presented her with a framed announcement of the lecture signed by the General Committee. President Millstein then made the usual housekeeping announcements, invited guests to join the Society, and thereafter, adjourned the 2338th meeting of the Society to the social hour at 9:48 pm.